The Coastal Resources Management Program (CRMP) has developed regulations for reconstruction after "the big one" as well as other severe storms (Section 180. Emergency Assents). More important are the regulations that are designed to minimize the impact of coastal hazards. Policies regulating where to build on a vulnerable property (Section 140. Setbacks), construction of shoreline protection facilities (various sections), and beneficial reuse of dredged materials help to mitigate some of the hazards associated with coastal living. Sea level rise is a hazard that is only indirectly addressed in the CRMP. 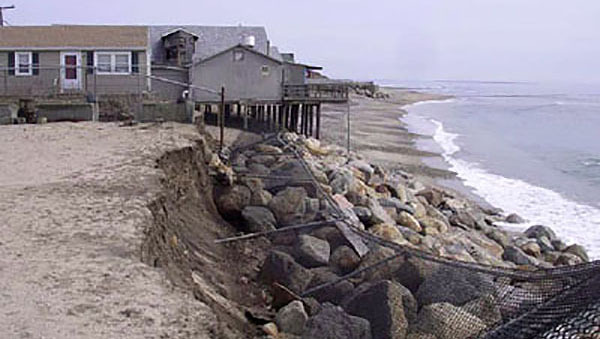 Erosion setbacks are very effective regulations that protect the homeowner and the public resources. Much of the Rhode Island shoreline is eroding. 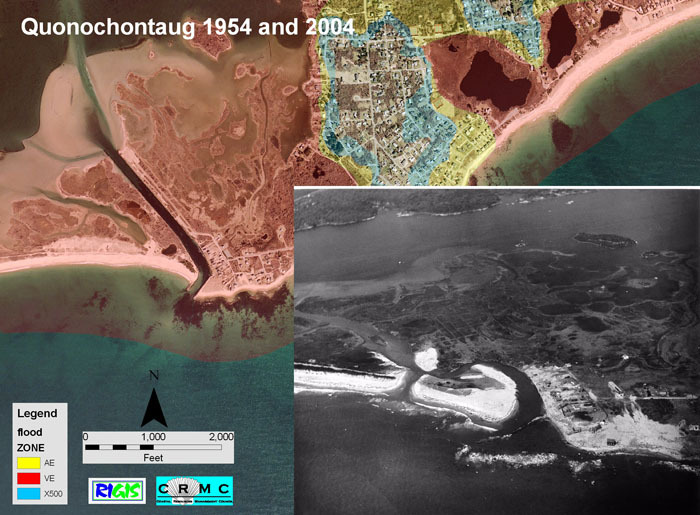 Erosion rates are calculated by comparing the shoreline location from historic aerial photographs to the most recent shoreline position. Sections of the south shore barriers have erosion rates of more than three feet per year. That is an average rate over time. In reality, the shoreline may erode tens of feet in a single storm, followed by some accretion. In critical erosion areas on barriers, all residential construction with less than six units must be set back 30 times and commercial property 60 times the average annual erosion rate. The farther the house or commercial structure is setback from the shore, the longer it will last. Unfortunately, these regulations were enacted about thirty years ago. The Council may want to consider policy for when the setback is gone and the structure is on the active beach (figure 1). Figure 1. House pilings in the wave swash. Old pilings and ISDS exposed after a storm. 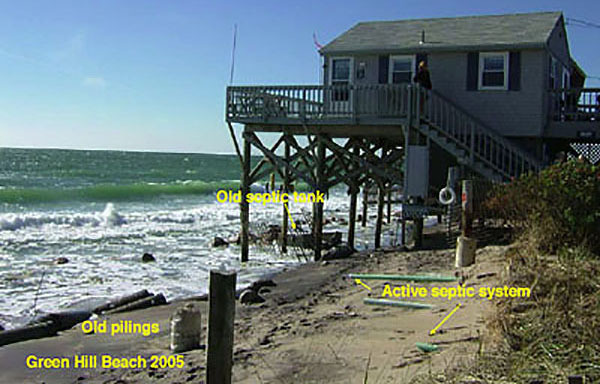 Impacts of storm erosion on ISDS are a potential public health problem (figure 2). 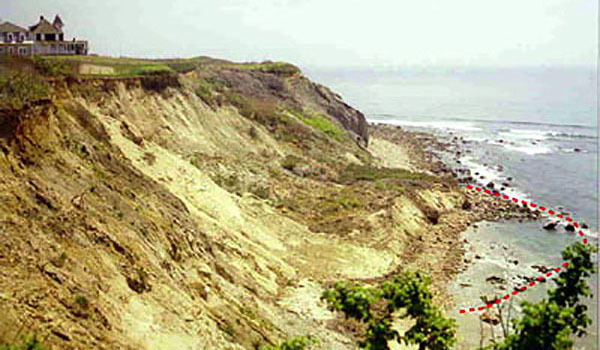 CRMC worked with RIDEM to develop regulations for repairs to ISDS in critical erosion areas (ISDS Repair Guidance in Critical Erosion Areas, January 31, 2006). Figure 2. ISDS exposed by storm surge and waves. Shoreline Protection Structures are prohibited along Type 1 shorelines except where they are used to protect historic structures that are listed on the National Register of Historic Places (Section 220). There are several reasons for this prohibition. The structures reflect wave energy, often causing erosion around the sides of the structure and can cause scouring seaward of the structure. In addition, the structures disrupt sediment transport, both by sequestering sediment that would normally erode from a bank or dune to form new beaches (figure 3), and by physically blocking the sand movement along the shoreline (figure 4). Shoreline protection structures often impact lateral public access along the shoreline. In other words, these structures help protect the property where they are built, but often harm adjacent properties. 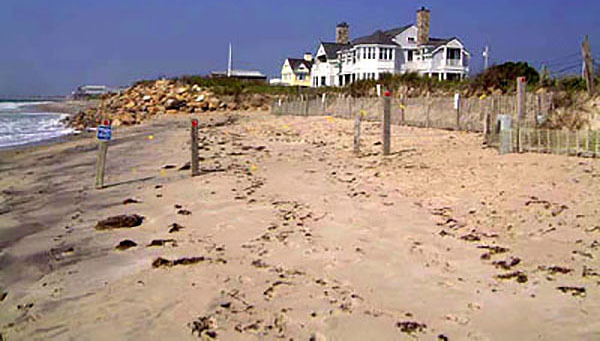 They are a contributing factor in the narrowing and loss of beaches, and they inhibit the public's right to lateral shoreline access (figure 5). 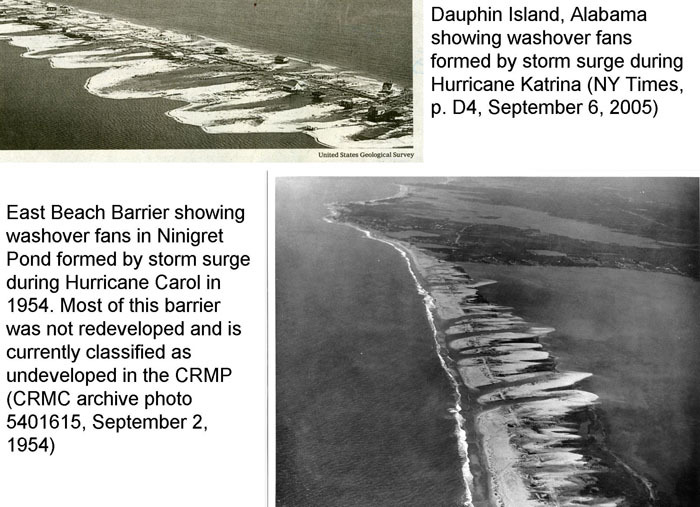 Many of the structures that were built prior to the CRMP cannot withstand moderate storms (figure 6). Figure 3. Sediment that erodes from the headland bluffs forms the beaches. The dotted line marks the extent of the slump block before the sediment was transported by waves and currents. Figure 4. The jetty interrupts the longshore sand transport. Figure 5. 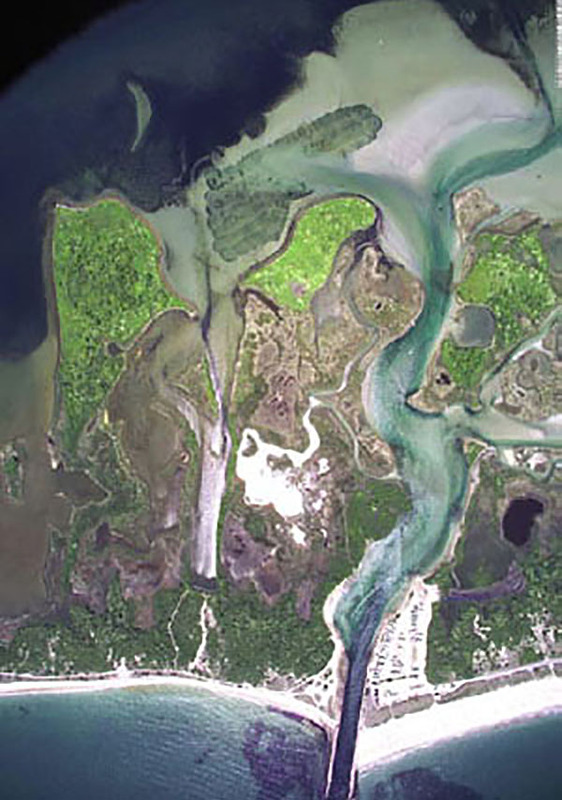 Lateral access is limited to low tide. Figure 6. Many shoreline protection structures cannot withstand moderate storm energy. CRMC advocates the beneficial reuse of dredged material. 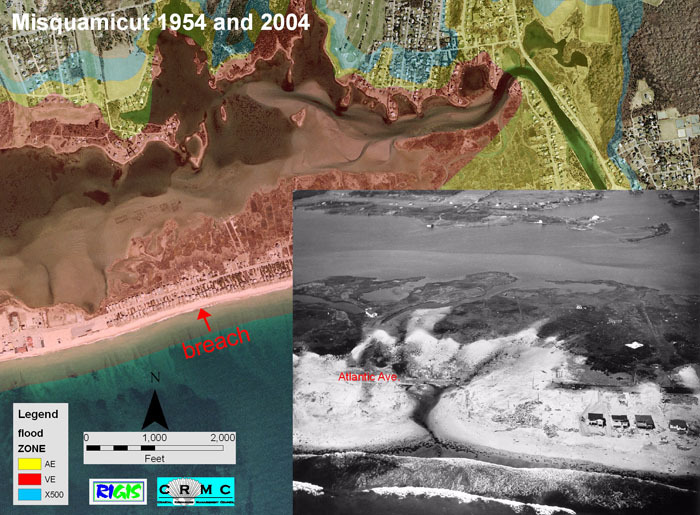 The South Coast Habitat Restoration Project is an example of beneficial reuse that has created wider beaches and has the secondary benefit of providing protection for some coastal properties (figure 7). Figure 7. Beach with dredged sand on the left shows no erosional scarp. The beach on the right shows dune scarp and newly exposed ISDS. "We continue to forecast a below-average Atlantic hurricane season. The tropical Atlantic remains cooler than normal, and there is a relatively high potential that a weak El Niño develops in the next several months. The probability for major hurricanes making landfall along the United States coastline and in the Caribbean is below normal due to the forecast for a below-average season. As is the case with all hurricane seasons, coastal residents are reminded that it only takes one hurricane making landfall to make it an active season for them. They should prepare the same for every season, regardless of how much activity is predicted." Probabilities of tropical storm-force, hurricane-force and major hurricane-force winds occurring at specific locations along the U.S. East and Gulf Coasts within a variety of time periods are listed on the Landfall Probability Web site. The site provides U.S. landfall probabilities for 11 regions and the individual counties along the U.S. coastline from Brownsville, Texas, to Eastport, Maine. Individual state probabilities are also available on this website. The website, available to the public at http://www.e-transit.org/hurricane/welcome.html, is the first publicly accessible Internet tool that adjusts landfall probabilities for regions and counties based on the current climate and its projected effects on the upcoming hurricane season. Klotzbach and Gray update the site regularly with assistance from the GeoGraphics Laboratory at Bridgewater State College in Massachusetts. In addition, probabilities for various islands in the Caribbean and landmasses in Central America are now available on the Landfall Probability Web site. Hurricanes: Science and Society – Major goals of Hurricanes: Science and Society are to provide foundational science for understanding complex scientific content, inform visitors about current scientific and technological advances, and to help visitors make good decisions prior to and during a hurricane emergency. All of the town council members signed the commendation, given to the CRMC on June 3, 2013. The CRMC is honored by the town council’s commendation. The following lists the relevant sections of the Coastal Resources Management Plan (PDF) dealing with coastal hazards. Section 300.7. Construction of Shoreline Protection Facilities.